Shall I dare to disparage? This is not my favourite era of Jack Kirby art. I'm much more a fan of his blockier work in things like Devil Dinosaur and Captain Victory. I don't know if it's the inking (which, interestingly enough, the write-up inside this issue claims was inked by an unknown inker), but it seems sloppy. Not the clean lines I've come to expect from Kirby's art. 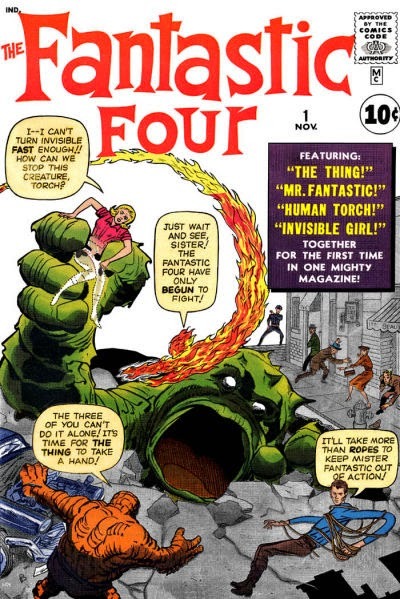 Regardless of that, this is the first Fantastic Four comic! Yes, it's dated. Yes, Stan Lee's dialogue (especially that of The Thing) is, well, Stan Lee's dialogue, but think about what came out of this comic. Everything Marvel. I've raved about Jonathan Hickman's run on Fantastic Four a few years back, and it would not have been possible without this awkward, but genuinely inspired, piece of superhero storytelling. And, of course, there's that original cover, that's been, in the musical vernacular, covered so many times, and that will pass into the iconic images of comics history, if it hasn't already. Okay, still exhausted, but at least that was a little more coherent than my last few posts. 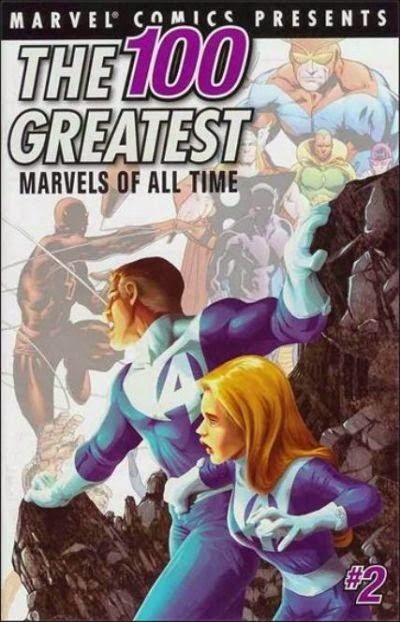 Can you guess what the greatest Marvel of all time will be? I'm sure you can.